One of Modor's newest Eurorack releases. What is a Comb Filter? It is a digital filter where the input signal is mixed with a slightly delayed version of the input signal. You won't hear it as some kind of an echo, as this delay is very short (40ms at max). But the mixing process creates a number of equally spaced peaks and holes in the frequency spectrum, that make it look like the teeth of a comb. That's where the name 'Comb Filter' comes from. Comb filters are typically used to make chorus and flanger style effects. These effects are created by modulating the delay time. With longer and relatively fast modulated delays you receive a chorus effect. With short to very short slowly modulated delays, combined with some feedback you'll get the typical sound of a flanger unit. So, the most interesting parameter in this is the delay time. That determines the frequency spacing of the comb teeth. So that's why there's a CV control for it. The typical chorus and flanger effects are made by modulating the delay time with a triangle LFO. So there's a triangle LFO onboard the module, with speed control. If you don't enter any CV in the CV1 connector, it is normalled to this internal LFO to make typical effects. 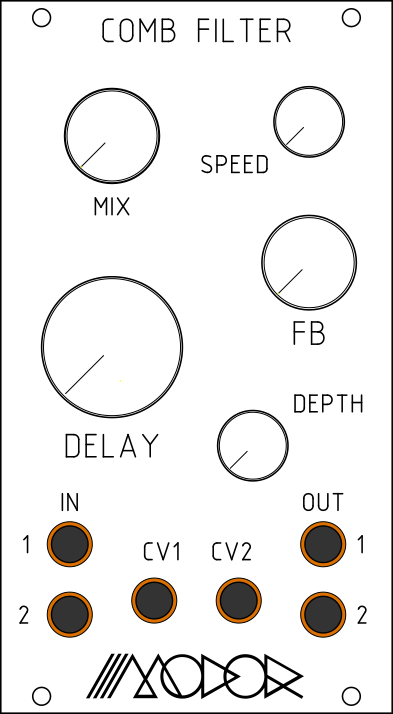 CV2 is normalled to the reverse signal of CV1, to make Modor's typical wide stereo effects, just as on the NF-1 synthesizer. But of course, you can enter your own CV signals in there: LFO's, Envelopes or some rhytmically undulating spacy voltage signals... Check it out!